WACKADOODLE: "Well, why is there gravity?" ME: "I've no idea, that's a religious question." WACKADOODLE: "It's not a religious question! Why is there gravity?" ME: "OK, maybe not a religious question, but it's one science cannot answer." I love my wackadoodles, the students swimming in the lowest depths of the class rankings, who keep questioning everything, a prescription for disaster in public schools. This particular wackadoodle unearthed one of my prejudices. If a question worth answering cannot be answered by science, I label it religious. Some thoughts I should keep to myself. Teaching (on a good day) reflects the fine line between ordered cortical thought and the mad, wise ramblings of the limbus. I have been reading Gravity and Grace by Simone Weil, and I suspect that that's where my odd assertion about religion popped up. I heard gravity, started thinking grace, and, not expecting the question, gave an unexpected answer. I might consider rediscovering my frontal lobe. You cannot teach science without bumping up against limits of knowledge. "What it is to know" is not limited by science, especially by the narrow view of what passes for science education here in the States. Ah, look, there's an amoeba....and there's a corpse plant....over here is a yeti crab. 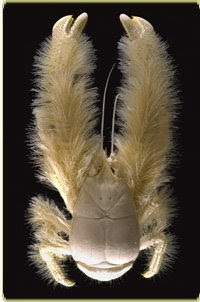 If you can look at a yeti crab and not wonder at the whole absurd and loving complexity of the biosphere, you may want to reconsider teaching children--they are far more interested by the fact that a yeti crab exists than its molecular make-up, and questions of existence put you on dangerous ground in a science classroom. Charles Darwin was closer to the truth than we give him credit for. And gravity? This inexplicable pull every object has towards every other object in the universe? It may be a religious question after all. 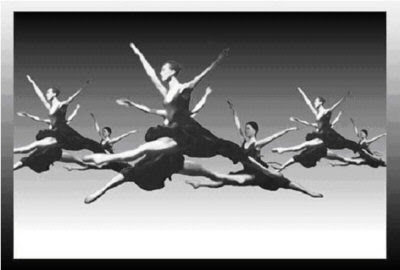 The flying dancers are from the North Shore Civic Ballet. The yeti crab is from the Pacific Ocean. A great alternate assessment for the proving of gravity-- ask your student to throw themselves at the group..and miss. If they do miss, they fail the assessment. Just remember the wonderful construct from Haroun and the Sea of Stories by Salman Rushdie - The Process Too Complicated To Explain (or the P2C2E). The P2C2E House and the Eggheads in charge keep all those processes running and manage them. Sorry to be absent so much of the past week. I too am torn - but I am between the gravity of midsemester reports & yearbook proofs and the call of the garden and yard. One of them figured out (with little guidance) why merely sending up a fleet of spaceships alongside a rogue asteroid might be enough to avert disaster should one be headed our way. Strip the algebra away and the naked view of gravity leaves folks gasping once they wrap their heads around it. I did ask the class where they'd weigh more, here in Bloomfield or on top of Mount Everest. Quite a few of them got it! Always good to see your words, no need to apologize--spring has sprung and I am wrestling with my annual should-I-toss-this-life-sucking-machine-out-the-window. I like writing on paper in a journal no one will likely read. I can do that outside when the light is low enough to entice lightning bugs to seek each other out to share some DNA. I've never seen lightning bugs dance inside my home. I've never not been amazed when sitting outside at dusk just watching night settle on me, on us. I never miss much here. I've missed a few sunsets, though.